Here is Andy Merrifield on ‘Europe’s New Urban Question’, speaking at Kentucky a month or so ago. 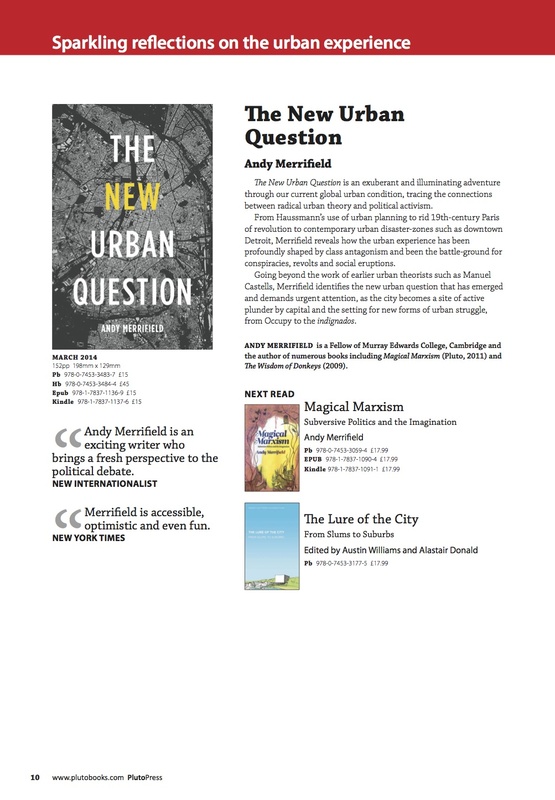 Personal and political interrogations from Andrew here, trailing his new book, The New Urban Question. Here is the latest provocation from Andy Merrifield, on how to think about the politics of the macro-processes behind situated experiences of urban change. In the latest issue of Radical Philosophy, an essay by Derek Gregory on Drone Geographies (same issue has an appreciation of Marshall Berman by Andy Merrifield). There has been a flurry of interest in the theme of ‘planetary urbanization’ recently. Andy Merrifield has an essay on the theme of ‘Whither urban studies’, and there is a longer published version of his argument about the contemporary fate of the old-fashioned sounding ‘urban question’ (and Andrew has a new book coming out on all this too, The Politics of the Encounter). There is a video of the workshop discussion of the same theme at theurbanfix. This post also includes a link to a lecture by Neil Brenner on similar themes, re-posing ‘the urban question’ as ‘the urbanization question’ – and outlining some themes from a paper on planetary urbanisation by Brenner and Christian Schmid in a recent collection, Urban Constellations, edited by Matthew Gandy. My interest in these interventions arises both from some things I have been trying to work on (teach, mainly), and also because I am meant to give a paper in a session at the 2013 Association of American Geographers meeting in a set of sessions on the future of critical urban theory. Reading and watching these and other things are helping me to clarify what it is I might try to say then. There are some interesting overlaps in the arguments being made across this range of ‘post-Lefebvrian’ urban theory (I just made that up). There is the gesture of noting and then taking one’s distance from the oft-repeated line about ‘more than half the world’s population’ now living in cities, or at least in some type of urban settlement. It’s no doubt sensible to pause awhile about such stylized facts (although the stats about urban population growth might be better thought of along the lines suggested recently by David Runciman in LRB, as representations that enable certain sorts of political work to get done, not just as data to be dismissed as empiricist distractions). The distance-taking involves a move towards a claim about what urban theory can and should do, negatively and positively. It should definitely not, it turns out, presume the adequacy of taken-for-granted, ‘positivist’ understandings of what a city is, or of what counts as an urban settlement more generally – that risks buying into not only out of date notions, but ‘ideological’ ones too. What urban theory should do is burrow down into the ontological – to define clearly what the object of analysis of what-used-to-be-called- ‘urban studies’ actually is, in all its multiplicity-yet-dialectical-unity. It’s not at all clear why any intellectual field needs this sort of philosophically underwritten definitional clarity – other than as a prop to cope with a lack of confidence. Don’t get me wrong – I think the arguments going on here are, in terms of their content as it were, really interesting: Brenner and Schmid’s theme of concentrated and extended urbanization processes is a really neat way of capturing the dynamics of contemporary spatial processes; Andy Merrifield has a really interesting riff about thinking of so many urban attributes (but I’m not sure we need to think of these as all an expression of a singular substance). In general, the story seems to be that we should think in terms of processes, maybe practices and strategies too, rather than fixed entities like ‘cities’ or discrete spatial objects like ‘the urban’. I suppose. This is a not unfamiliar argument of course, one made around issues of scale, for example, or indeed pretty much any other concern touched by Theory – personal identity, the state, Capital. I wonder whether this is really all that exciting any more as a claim about what theory can do for us. It is actually rather odd to assume that one needs theory to gain insight into the made-up, enacted, assembled, contingent, flow-like qualities of things that we often talk about and experience as if they were thing-like. And if theory is given this special privilege in the register of revelation, attached to a claim about its ‘political’ significance, then there is a risk of missing some important dimensions about the ordinary ways in which things (cities, states, people-with-identities) configure our lives in manageable, responsible ways (it also risks buying into some hoary modernist notions that somehow ordinary language isn’t quite adequate to capture the processual and relational qualities of live; it is, of course, perfectly adequate for that task, that’s why we have words like ‘process’ and ‘relation’ in the first place, and verbs, stuff like that). ‘Localities of 200 more inhabitants’ (Greenland); ‘Agglomerations of 2500 or more inhabitants, generally having population densities of 1000 persons per square mile or more’ (USA); ‘Towns, that is, localities legally established as urban’ (Bulgaria); or just ‘Town of Stanley’ (Falkand Islands(Malvinas)). Borges’ lesson about the arbitrariness of classification was, of course, that the seemingly arbitrary qualities of classifications which lack definitive clarity are best read as an index of specific practical purposes and plans. I suppose, then, that doubts about the adequacy of some concepts of the urban are really an indication of doubts about the value of the projects of which those concepts are central. Radical urban theory, after all, has been consistently suspicious of ‘applied’ styles of urban thinking, those too closely connected to fields of planning, for example, or development, or even environmental management, where all those clunky concepts of bounded settlements and territorialised objects do their useful work – preferring to identify with social movements, and with more or less concrete imaginations of protest and resistance. I have to come to like the idea that ‘the urban’ is really a name for a problem, or for a series or variable problems (not quite the same as thinking of variable ‘attributes’). This is an idea I am stealing for my own purposes from my colleague Allan Cochrane, who develops it in his book on Urban Policy (if one is looking for an authoritative Theory reference, Foucault’s observations in his lectures on Security, Territory and Population about ‘the problem of the town’ might be a fun place to start – ‘the town’ emerges there as a figure for an extended network of dependence and vulnerability to which various agencies seek to respond). Allan, Scott Rodgers and I have been trying to articulate some of the implications of thinking about the urban in this way, partly through an edited collection on the theme of ‘Where is urban politics?’ that might hopefully see the light of day next year. Meanwhile, I have also tried to articulate the same set of ideas while thinking about making an OU Masters course on the theme of Changing Cities intended primarily to translate critical urban theory into a useful resource for those professions who act as key ‘intermediaries’ of contemporary spatial politics (planners, environmental managers, those sorts of people, maybe the occasional ‘activist’). To cut a long story short, I think the point would be that all those various attributes of ‘the urban’ are generative of their own points of political contention – but also that there is more to the variety of urban politics than protest; and indeed, that there is often more to protest than protest (protest is a form of claim-making, after all, of one sort of another). And, finally, that there is no reason whatsoever to assume (or want) this variety of urban-generated-but-not-contained politics to coalesce into anything so coherent as ‘revolutionary politics’ (one of the unacknowledged achievements of Marxist spatial theory is to demonstrate that the universalised agency required of a revolutionary political imaginary is always already, as they say, displaced and deferred). So I have decided that arguments about the need to update and refine, specifically, to refine, our understandings of urban and urbanization, by posing this issue in terms of a debate about ‘the urban question’ from almost 40 years ago, tell us more about the operative concept of ‘theory’ at work in certain strains of critical urban and spatial theory than they do about how best to think about the meaning of ‘urban’, urbanism, the city, or urbanization. I wonder whether theory is really the sort of practice that has the task of isolating the ontological outlines of phenomena – of ‘the urban’, or perhaps, ‘the political’, from the appearances of town and cities and mere politics (there is of course much the same concept of theory at work in accounts of ‘the political’ as in contemporary discussions of ‘the urban question’, sharing much the same intellectual lineage – not for nothing does the notion of ‘post-political’ attach so easily to discussions of ‘the city’). I wonder too whether theory is really the proper medium for identifying the immanent potential for radical change in current events. Theories are, by definition, always theories of something – which means that any theory is caught in a subordinate relation of accountability to something that it isn’t. Unfortunately, too often this ‘other’ of theory is just assumed to be ‘Politics’ – which means that an overly theoreticist account of theory ends up holding itself accountable to an overly theoreticist account of what counts a proper politics. 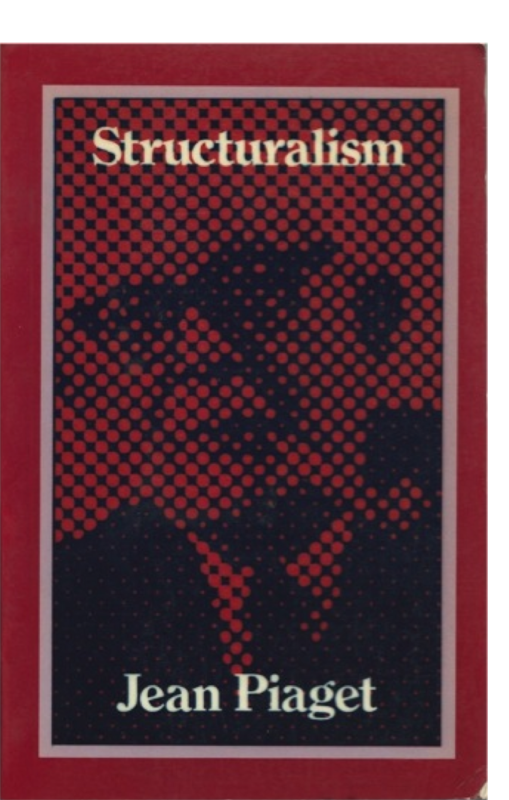 So I’m left thinking that what the current state of radical urban theory confirms is not so much that ‘the urban’ is conceptually incoherent, but rather that the model of theory at work in this field needs to be challenged.